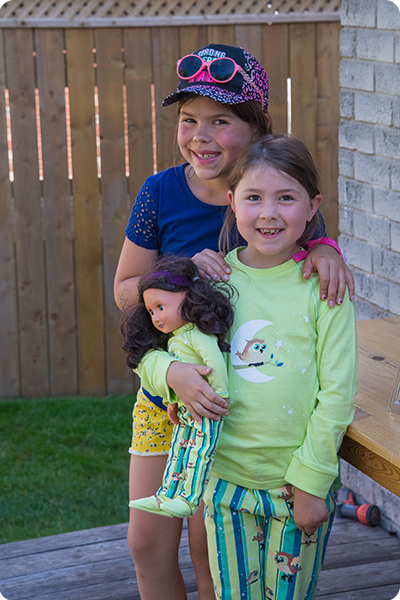 A few months ago, Bridget came to me after Claire was in bed to talk about a birthday gift idea that she had for her sister: matching pajamas for Claire and her doll, Willow. Her face, as she told me this idea, was just wide with excitement and love, so sure that this was a perfect gift for her sister. So together we ordered the pajamas online, waited for them to arrive, and then waited even longer for Claire's birthday to come. And it was was worth it, so worth it. Claire opened up Bridget's present first and there were a lot of hugs, kisses, and "I love yous", followed by a desperate need to try on pajamas - both herself and Willow - despite the heat of the day. The love between you girls is a beautiful thing to see.